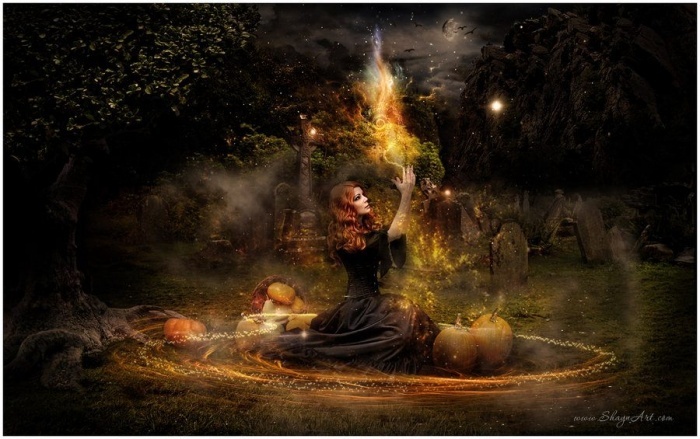 As millions of children and adults participate in the fun of Halloween on the night of October 31st, few will be aware of its ancient Celtic roots in the Samhain festival. In Celtic Ireland about 2,000 years ago, Samhain was the division of the year between the lighter half (summer) and the darker half (winter). At Samhain the division between this world and the otherworld was at its thinnest, allowing spirits to pass through. The family’s ancestors were honoured and invited home whilst harmful spirits were warded off. People wore costumes and masks to disguise themselves as harmful spirits and thus avoid harm. Bonfires and food played a large part in the festivities. The bones of slaughtered livestock were cast into a communal fire, household fires were extinguished and started again from the bonfire. Food was prepared for the living and the dead, food for the ancestors who were in no position to eat it, was ritually shared with the less well off. Christianity incorporated the honouring of the dead into the Christian calendar with All Saints (All Hallows) on November 1st, followed by All Souls on November 2nd. The wearing of costumes and masks to ward off harmful spirits survived as Halloween costumes. The Festival of Samhain marked the end of the Celtic year and the beginning of the new one and as such can be seen to the equivalent of New Year’s Eve. The Celts believed that night preceded day and so the festivities took place on the Eve of Samhain. The decline in the strength of the sun at this time of year was a source of anxiety for early man and the lighting of the Winter Fires here symbolised mans attempt to assist the sun on its journey across the sky. Fire is the earthly counterpart of the sun and is a powerful and appropriate symbol to express mans helplessness in the face of the overwhelming sense of decay of nature as the winter sets in. The idea that Samhain is a juncture between the two halves of the year saw it acquiring the unique status of being suspended in time – it did not belong to the old year nor the new. It could be said that time stood still on this night and the implications of this were immense. During this night the natural order of life was thrown into chaos and the earthly world of the living became hopelessly entangled with the world of the dead. But the world of the dead was itself a complicated place, peopled not only by the spirits of the departed, but also with a host of gods, fairies and other creatures of uncertain nature. However, the ghosts may not have been entirely benign. They needed some sort of appeasement in the form of ritual offerings on this night. So long as the offering was forthcoming the ghosts were happy and benevolent, but if the offering was withheld another side of ghostly features were presented. Bad luck would descend on the household for the coming year. A vestige of this tradition survives in the modern Halloween custom of “trick or treat”. Children, dressed as ghosts and witches, invite the household to make a donation or face the consequences. The ‘treat’ may represent the ritual offering while the ‘trick’, nowadays a harmless prank, may have in antiquity represented the malevolent consequences of inadequately appeasing the ancestral ghost on this night. The early Irish manuscripts are littered with references to the magical significance of Samhain. It marked the end of the fighting and hunting season for the warrior troop known as the Fianna. At Samhain they retreated into winter camp, quartering themselves on the general population until the return of Summer at Bealtaine. There remains little doubt that Samhain held a central place in the imagination of the Celts, where the festivities associated with several local gods became entangled, over the course of perhaps a thousand years, with the feast of the god of the dead. Remnants of these celebrations have come down to us in our own celebrations of Halloween. This entry was posted in Uncategorized and tagged Ancestors, celtic tradition, Halloween, Ireland on October 31, 2014 by colletteom.